Pazhani Subramanya Pillai who belonged to the Pudukkotai tradition was the star disciple of Pudukkotai Dakshinamurthy Pillai and it is after his name that the Pazhani School of playing evolved.He, while retaining the salient features of the Pudukkotai tradition, introduced many innovative features.He is credited with presentation of patterns with "ghumkis" (graces).Predominance of the soft and simple sarvalaghus to sweeten music, their logical development into astonishing varieties and tirmanas and the clarity of strokes in fast play formed fascinating traits in his artistry. A left hand Player Subramanya Pillai accompanied on either Mridangam or kanjira. 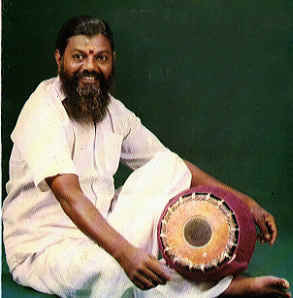 Subramanya Pillai was an Asthana Vidwan in Trivandrum Court. He was a professor at Tamil Isai College and Advisor at All India Radio. Born in 1912 of Smt. Anandambal and Sri Tiruvilvamalai R Sesha Bhagavatar, a well known musician, at Pazhayanur, Mani Iyer had his first lessons in Mridangam, when he was nine years old,from Sathapuram Subbier and later under Viswanatha Iyer. He made his debut in The Music Academy when he was only 14 years of age. He came into contact with mridangam vidvan Tanjore Vaidyanatha Iyer with whom he had further training in the intricacies of the art. He became closely associated in numerous performances with Pudukottai Dakshinamurthi Pillai. He received Sangeetha Kalanidhi for Carnatic Percussion Instrumental in 1956 and was also invited in 1965 to participate in the Commonwealth Music Festival in London and in the Edinburgh Festival. The degree of his instrumental perfection and the genius of his playing with minute attention to the styles of the main performers made him an artist of unparalleled calibre in the world of Carnatic music. He gave more importance to pauses which add laya lustre. He gave a totally new dimension to 'tani avarthanam' playing in concerts. Mani Iyer held the view that a 'tani avarthanam' is not such a big affair since the mridangist only repeats the 'korvais' and 'kanakkus' he has thought about and practised at home. Also, according to him, the mridangam accompanist taking more than 10 minutes in a concert for his solo turn was no good. This is in sharp contrast to the current trend in concerts which witness laya bouts in the name of 'tani avarthanam' for durations ranging between 20 and 30 minutes, creating the process a side show. Mani Iyer felt that a percussionist should also have knowledge of songs mostly sung in concerts for he had realised that knowledge of the movement of musical patterns enables a percussionist to play his 'sollus' with perception and he was himself a good vocalist. 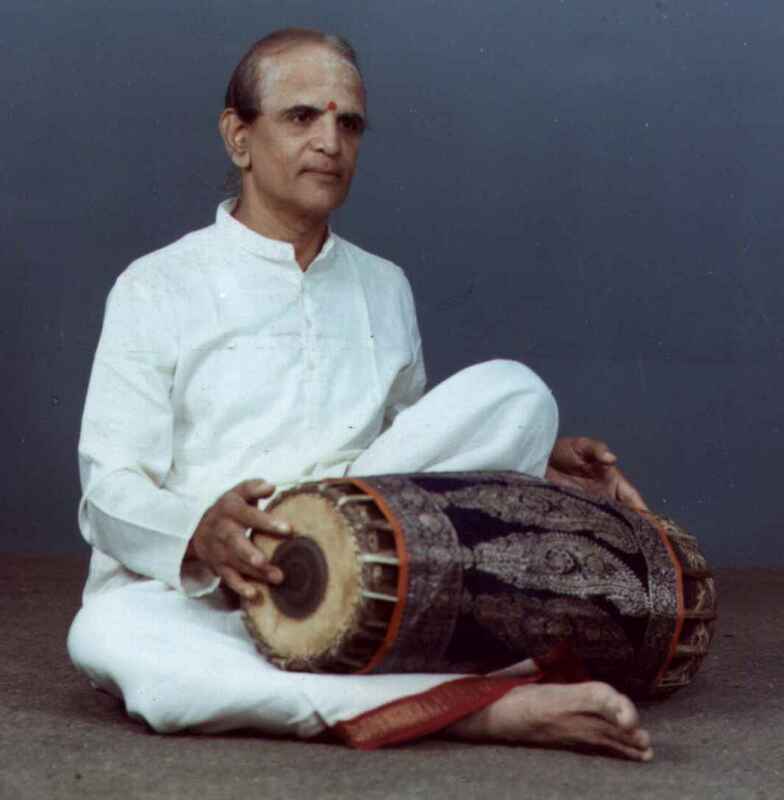 Mani Iyer's playing on the instrument created the essential understanding even for the uninitiated through the various melodic sounds of rhythm, and made them sit up and appreciate. The percussion instrument was put in a high pedestal by Mani Iyer. In the area of accompaniment Mani Iyer stands the tallest for all times. His acute awareness of the singers' or instrumentalists' micro - second level nuances - his acute sense of the particular situation or context of a sangathi/sahitya or even a vocal accent, and how he responded to it with his mridangam play or even very sensible silence - this heralded a new era of percussion. The infinite ways of adding colour to a Kriti, Niraval or Swaraprasthara by changing the Sarvalaghu patterns in midstream or even the Nadais and the sudden fast forward or reversal of the Chouka, Madhyama and Duritha or the incomparable use of the left for emphasis, softness and emotive effects bring forth his greatness. Murugabhoopathi was born to Chitsabhai Serrai of Ramanathapuram. He had his training form his father and his brother C.S.Sankara Sivam. He was a favourite Mridangist for the flute maestro T.R. Mahalingam. Murugabhoopathi has been the visiting Principal for Tamil Isai Sangam Music school, Madurai and has been a member of the Advisory Committee Government Music College Madras. He has received numerous titles including the Kalaimamani, Padmashri and the Sangeet Natak Academy Award. Born on 17-12-1935, he is the son of Dr P. Kasiviswanatha Iyer and Smt Kamalambal. His father, a medical practitioner and himself an accomplished musician, had with insight and intuition nurtured the inborn talents of his son and got him rightly initiated into mridangam through the gurukula discipline under scholarly practitioners. Sivaraman learnt this divine art under four great and illustrious masters : Arupathi Natesa Iyer, Tanjavoor Vaidyanatha Iyer, Palghat Mani Iyer, Kumbakonam Rangu Iyengar. The pursuit of this art under the gurukula system for well over fifteen years did not deter him to qualify for law. He is a double graduate of The University of Madras (B.A., B.L.). As a boy of ten, Sivaraman had his ‘arangetram’ (first concert) and the debut was held in the precincts of Kalahastheeswaraswami temple in the temple town of Kumbakonam. Having made his debut at a tender age of ten, Sivaraman has been in the field as a ‘top notcher’ for half a century now, accompanying a galaxy of maestros of recent past and artistes of great merit today, both vocal and instrumental. His new techniques, innovations and creative ability in accompaniment, solo renditions, and jugalbandhi; programmes with his North Indian counterparts have earned him a special place in the world of art, worthy of emulation by other artists. Besides his professional career, he had undertaken the very laudable task of doing original research in the art of mridangam. This resulted in his highly acclaimed lecture demonstrations done in all important centres in India and abroad, which enabled him to disseminate knowledge of this divine art to art lovers, music conferences, music seminars and the like. He is the only mridangam vidwan who has explored and placed before the world of art lovers authentic information on the techniques and nuances of mridangam for more than two decades. He has introduced the fibre glass mridangam to Carnatic music for the first time, improvised a mechanical jig to eliminate human error in the moulding of skins for both sides of the instrument and has done research work on tanned and untanned skins for the mridangam. His analysis of the ingredients of the black patch has given much insight on the overtones produced by different strokes on the mridangam. Sivaraman is an ‘A’ Grade artiste in All India Radio and Doordarshan Television. He has presided over the Annual Music Conference of the Indian Fine Arts Society, Madras, in 1984 and was conferred the title of Sangeetha Kala Sikhamani. Sivaraman has been appointed as the Director for ‘Tanjore Vaidyanatha Iyer School for Percussion’ recently started by the Music Academy, Madras. Several honours and titles were bestowed on Sivaraman for his great services to this divine art. He was conferred the award ‘Padmashri’ by the Government of India in 1988. He received Sangeet Natak Akademi award for mridangam for the year 1992. His titles include Laya Jyothi, Laya Gnana Bhaskara, Sangeetha Kala Sikhamani, Mridanga Nadamani (bestowed by His Holiness Shri Sankaracharya of Kanchi Mutt), Mridanga Chakravarthi, Nada Sudharnava, Tal Vilas, and Laya Gnana Tilaka to name a few. He has trained many Indian and foreign students in the art of mridangam and continues training more disciples. 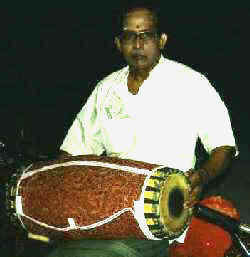 Karaikudi R Mani is India's top ranking player of the mridangam. Mani who had his training under eminent teachers, has established a unique playing style which is marked by great virtuosity and pleasing sound quality. Mani, who has been described as a "mridangist who beautifully blended sound, scholarship, sense and silence", has composed and launched numerous intricate and erudite rhythmic combinations which have influenced and won acclaim from music lovers as well as from other musicians. The quality of Mani's artistry has established beyond doubt the capacity of the mridangam to be presented as the main instrument in solo recitals. Mani has made a distinctive contribution to the development of the art of percussion through the innovatively novel percussion ensembles he has devised entitled "Sruthi Laya" with top ranking artists. Mani was also responsible for the formation of the musical orchestration of cultures called 'Melodyssey' consisting of 40 artists of South Indian, North Indian and Western instruments along with voices. This innovative orchestration won widespread appreciation. Mani has also introduced the Laya Ratna percussion duet concerts which have been performed in most of the leading forums in India. These concerts promote a greater understanding of the rythmic aspects of percussion. Mani's objective in the formation of yet another unique percussion ensemble of young artists, entitled Tala Vichitra ( Rhythmic peculiarities), has been the integration of various contemporary styles of South Indian Percussive art form. Mani founded the institution Sruthi Laya Seva Trust in Madras and Mysore in India, and in Melbourne and London to impart systematic training in Mridangam for advanced students. Many awards, titles and honours came to him which he shunned for developing his art with greater devotion. Born on 2nd July, 1935 Guruvayur Dorai started to play mridangam at a very young age.His gurus were the Palghat Subba Iyer and Pazhani Subramanya Pillai. His 'Arangetram' (first concert ) was held at the Srikrishna Temple at Guruvayur at the age of 8 when he played for the renowned Chembai Vaidyanatha Bhagavathar. In 1954, he got a rare oppurtunity to accompany the legendary Nadaswaram artist T N Rajarathinam Pillai. Since then Dorai has accompanied almost all famous carnatic musicians in in an illustrious carrier that has spanned five decades. Dorai has taught mridangam at several music schools. He was a visiting Professor at the University of Washington, Seattle between 1977 - 1978. In 1979, he taught at the Sydney University, australia in conjunction with Professor T N Krishnan. Dorai is currently the Dean of temple of Fine Arts, an International organisation for the promotion of Fine Arts and Dance in Kuala Lumpur.